Do you use LinkedIn as a networking tool? Are you looking for ways to use LinkedIn to attract more business for your company or brand? 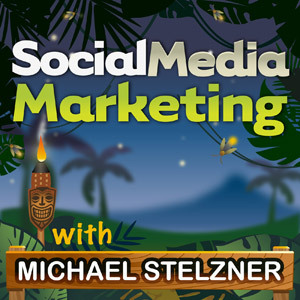 To learn how to optimize your LinkedIn profile as a marketer, I interview Ron Nash, the “LinkedIn Whisperer,” for this episode of the Social Media Marketing podcast. It’s designed to help busy marketers and business owners discover what works with social media marketing. The show format is on-demand talk radio (also known as podcasting). 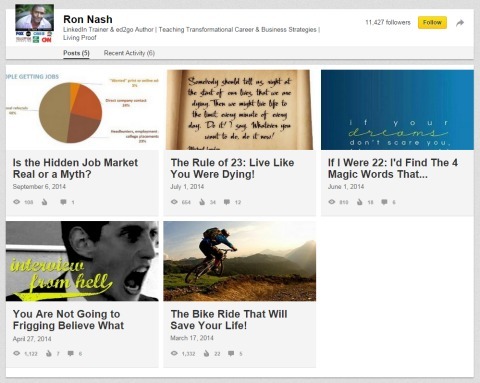 Listen to Ron Nash discuss optimizing your LinkedIn profile. 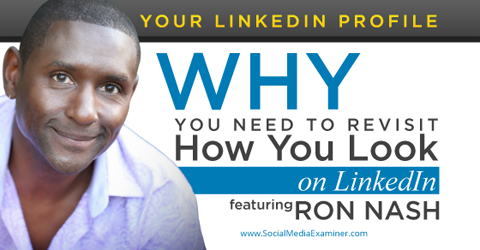 Ron shares the importance of having a well-developed LinkedIn profile. You’ll discover how to present yourself on LinkedIn, write an engaging professional headline and summary and strategically leverage images and video on your profile page. As a corporate recruiter and business owner, Ron discovered LinkedIn in 2003 and was an early adopter of the platform. Once he saw LinkedIn’s viability in developing business clients and recruiting candidates, he started “running down that street like there was no tomorrow,” as he put it. Ron was an early adopter of LinkedIn. Many years later, LinkedIn considers Ron to be one of their top 1.5% of people with a large network, as well as one of their top 15% in terms of using the platform strategically. Listen to the show to find out how Ron went from using LinkedIn to recruit talent to teaching other people how to successfully use LinkedIn. A lot of people approach LinkedIn as just a place for job-seekers and treat their profile just like a resume, which is a flat, two-dimensional experience. LinkedIn is actually a multidimensional tool that allows you to tell your stories. It’s called transmedia storytelling. LinkedIn is one of the first professional platforms where you can set up your profile, stage your brand or service and tell a story with other media. Set up a profile on LinkedIn and get your brand out there. Ron explains that LinkedIn is like a new TV station. With its 300 million users in 200 countries, people are on it 24/7. You’ll hear why it’s more critical than ever to be creative in the way you present your brand. The number-one activity on LinkedIn is people checking out your profile before they allow you into their network. So first impressions count. Listen to the show to hear how LinkedIn is integrated into the powerful networking happening at the Social Media Marketing World conference. The biggest mistake people make is that they interact with LinkedIn as though it’s a resume. Ron says that it’s a great opportunity, depending on how you treat your resume, but it’s also a tool in which you can incorporate other visual aspects. Ron states that behaviorally, resumes are a 20th-century thing; whereas in the 21st century you have the opportunity to insert video and images. As a marketer, you have the ability to bring your LinkedIn profile to life with images and video, which speak louder than written words. Listen to the show to find out why Ron includes videos in his LinkedIn profile. Ron says that there are two ways you can position your Summary: you can either write in first person or third person. It all comes down to personal preference. When you talk from the first-person “I” standpoint, it’s a way to personalize the connection. From the reader’s perspective, he can see what you can do to help him. However, the third-person standpoint sounds like there is an endorsement or a recommendation from a credible third party. You’ll hear the strategy behind Ron’s Summary, and what he is trying to accomplish with it. Ron starts his Summary with a few compelling questions. Ron states you need to think of your Summary as the opportunity to stage social proof for what it is you do. You can use up to 2000 characters to tell a story. You’ll hear about the different strategies that Ron teaches people to use—one of them being the “PAR” strategy. Listen to the show to discover why Ron chooses to start his Summary with compelling questions and what the outcome is. Ron explains the difference between the free LinkedIn profile and the premium account, which you can get for a small monthly fee. The basic premium account gives you the ability to upload a different image, which is used as a banner. You can choose your company logo or any other image relevant to your brand that you want the world to see. LinkedIn’s premium account allows you to brand your profile. You’ll hear the reasons behind Ron’s choice of profile picture, and why you should use the real estate that LinkedIn offers you. There are so many ways you can use images to improve your profile. There are several image formats that can be added to your LinkedIn profile, which include PowerPoint presentations, links, photos or anything else you would want to share. Listen to the show to discover what you should include in your professional headline. Your LinkedIn profile is an opportunity to stage not your own proof, but social proof of the work you do. Ron shares why he chose the two videos he included in his Summary and how they helped him. Make sure you use the opportunity to include video in your LinkedIn profile. Videos are a great way to share testimonials from customers. Ron says that it’s easier for someone to talk about the work they have experienced with him via a video. His rule of thumb is to be as professional as he can. Ron works with a video marketing firm to put together the videos he shares on LinkedIn and other platforms, so they are polished and professional as possible. Listen to the show to find out how Ron uses testimonials from thought leaders to leverage their work together, and to reach a broader audience. Prior to its IPO, LinkedIn allowed users to automatically push content to their profiles using their blog’s RSS feed. LinkedIn has since replaced this capability with its own Publisher feature. This strategic business move on LinkedIn’s part has generated more content published directly to the platform. LinkedIn’s Publisher feature allows anyone to push content directly to its global network. When you publish on LinkedIn, your content has the potential to be exposed to the biggest professional audience in the world. The key is to make sure your LinkedIn content strategy is relevant and meaningful enough to engage a wider audience. Listen to the show to learn how to grow and engage a larger audience through LinkedIn’s Publisher feature. Are you looking for a creative way to display photos on a blog or sales page? Are you just not satisfied with the usual methods of uploading images to your site? Have you heard about Easy Media Gallery Pro? Easy Media Gallery Pro is an easy-to-use WordPress plugin that lets you seamlessly upload images into galleries for posting online. It offers several configurations, editing options and a wide range of display functionality. After you’ve created your gallery, Easy Media Gallery Pro generates a short code that you can simply embed into any blog post or anywhere else online. Here is the plugin in action. Once the code is incorporated into your website, Easy Media Gallery Pro will automatically cycle through the pictures every couple of seconds. It includes navigation controls for your readers, as well as the ability to go full screen. Your readers can either sit back and watch the slideshow or navigate through the images at their own pace. The best part is that Easy Media Gallery Pro is equally as effective on a mobile device. Your photo gallery looks just as good on an iPhone as it does on a full 27-inch iMac. This plugin does not disappoint. Listen to the show to learn more and let us know how Easy Media Gallery Pro works for you. We are super-excited about Social Media Marketing World 2015. It’s the world’s largest social media marketing conference. By attending, you’ll make connections with 100+ of the world’s top social media pros (plus 2,500 of your peers) and you’ll discover amazing ideas that’ll transform your social media marketing. The event takes place in San Diego, California on March 25, 26 and 27, 2015. Hundreds of people have already purchased their tickets and have committed to coming to this conference. Connect with Ron Nash on LinkedIn or on his site, Jump Start Revolution. Check out the Bizzabo app, an all-in-one event networking platform. Read the article, Stand Out with the New LinkedIn Premium Experience. View a demo of Ron’s ed2go online course, Jump-Start Your Career With LinkedIn. Check out San Diego–based video marketing firm Videospot. Take a look at Easy Media Gallery Pro. You can also subscribe via Stitcher, SoundCloud and Blackberry. What do you think? Have you thought about monetizing your professional blog? Please leave your comments below.